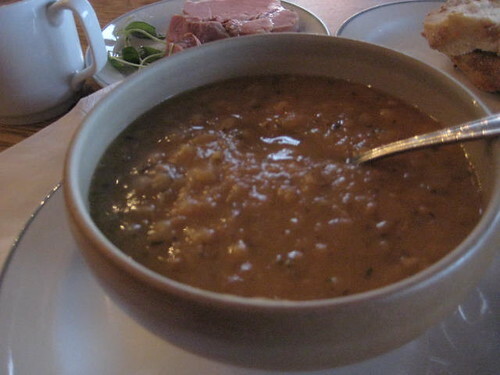 Here is the Thursday split pea soup- I read in the Time/Life books that Swedes always have this soup on Thursdays, and so I was very excited to sit down at a museum cafe and eat one, on Thursday. It’s a “fish Friday” institution, that you don’t want to make meat on Thursday as you won’t be able to eat the leftovers on Friday. I read in the book that if you asked a Swede, “Do you eat split pea soup on Thursdays,” you would be scoffed at for such a simple question, and of course, I repeated the question to my host and was laughed at (in a nice way of course). At the Vasa Museum cafe, for $20 dollars, I ordered the soup, and I originally thought it was ridiculously overpriced, until the cafeteria worker started piling on dishes onto my tray: a side plate of ham bones and beef, a salad, a plate of bread, and the huge saucer of soup. It’s a bit too salty for me, and I couldn’t finish it or eat the ham. That’s an aspect to the huge lunch that I’m having issues with- as I’m trying to continue the tradition here in the States. It’s just hard to eat that much at one sitting. The light meals in the evening are a lot easier, and as a computer worker, it takes some stress out of assembling and creating the evening meal. I have a lot more energy for foraging for a lunch than I do for a dinner. Written Monday, February 2nd, 2009 in food, travel. You can leave a response, or trackback from your own site. Does anyone eat bean soup because it looks good? the foods look delicious! When I am in travel I always have the good hotel and good price to stay in and of course good foods. That is why because of LMT. Yes, they have a very great deals and services that's why I really love them so I am recommending them also to all. Well the foods look good and yummy! I think your $20 worth it. Your tummy would be so happy taking them.. The second picture look that it tastes better than the first pic. I like foods with a cream on top.